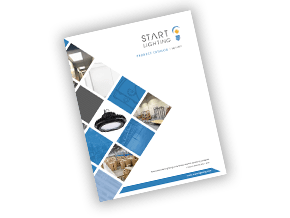 START Lighting, a progressive, entrepreneurially-oriented commercial and industrial lighting company committed to supporting electrical and lighting distributors, recently consolidated three remote warehouses into one larger warehouse to support continued growth. The new space increases the company’s warehouse space by 150%, enabling it to further service distributor needs and ensure high fill rates. 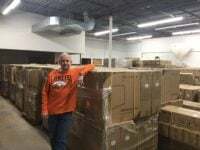 The company is now located at 14 Inverness Drive East Suite F-156, Englewood, CO 80112. The phone number, which did not change, is (866) 862-9352. In conjunction with the expansion, START introduced its first print catalog. This new, 48 page catalog covers 16 product categories. Said Barbour, “As a technology-oriented company driven to support the channel we initially wanted to place our product catalog online. While our website traffic is great we were having requests for a print catalog. Not to say that some are “old school”, but we want to serve all of our customers however they’d like to be served. I’m very proud of our catalog and the accompanying one-page product overview we produced. The catalog and one-page overview are available in .pdf forms at on our website in the Resources section or can be requested by contacting Nicole Bagozzi, Director of Sales, at nbagozzi@start-lighting.com. The following post commenting on START Lighting joining NEMRA first appeared on ElectricalTrends.com, an important electrical distribution industry blog. It was authored by David Gordon, who started Electrical Trends and is President of Channel Marketing Group. View the original post here. That NEMRA agents, traditionally more supply-oriented, are getting more and more involved in lighting. While lighting agents may control the new construction market, we hear more and more that NEMRA agents are involved in the growth of the lighting industry as they are involved in the lighting renovation market. And while some distributors may not like this, they are also generating revenues at the ESCO level for manufacturers. With so many lighting manufacturers in the industry, being number 94 on a lighting agent’s linecard unfortunately doesn’t capture any share of mind, which is what is necessary for generating revenue. Many manufacturers feel that the NEMRA meeting is either THE or one of the key conferences of the year. It attracts over 1900 people and, most importantly, it is the sales meeting for many manufacturers. Any manufacturer of consequence attends as does a very high percent of the NEMRA rep members. NEMRA essentially represents, and speaks, for the manufacturer sales organization as 80% of industry manufacturers represent at least 60% of industry sales (and increasing as some direct sales manufacturers have mixed in some reps in certain territories or aspects of their offering). And as a small company where investments are scrutinized for their ROI and joining associations are questioned as it relates to their value, START saw value in joining an association tied to driving revenue and supporting their sales organization … the people who connect to their customers. Assuming a significant number of manufacturers become NEMRA members, this can have benefits for distributors as well as the reps.
NEMRA may be able to aggregate training, either from these suppliers or develop innovative training and marketing options that are co-funded by these companies, provide a networking environment for complementary companies. Develop strategies to help reps pursue the elusive ESCO market and gain more insights into the renovation / remodel market so that they can add more value to their distributor channel partners. For a small lighting manufacturer (and manufacturer in general), NEMRA can be the start for accelerating their growth.